The Evangelical Alliance has been surveying Evangelicals. 1,730 of them, to be precise. And it transpires that four out of five of them think government policies to tackle extremism may make it harder for them to share their faith. Perhaps the other 20% is either not paying attention to sinister developments, or doesn’t grasp the essential Christian mission. Two thirds of respondents to the Alliance’s survey on ‘British values’ felt that the current attempt to define those values was “a reflection of the country’s identity crisis”, and three quarters agreed that “freedom of speech needs greater protection”. The glass is almost full.. but is it not astonishing that 25% of Evangelicals believe the state of our freedom of speech is just fine and dandy? It is now apparently a public order offence to quote Leviticus; it is a crime to criticise Islam via electronic media; and an offence not to bake a cake bearing a slogan one considers to be immoral. In fact, it is increasingly difficult to express any orthodox view on sexual morality or the uniqueness of Christ for salvation without being stoned with ‘-phobe’, ‘hate’ or ‘bigot’. Are these 25% asleep in the light? Evangelicals are broadly supportive of government plans to define and promote British values (71%), and, although they consider it a reasonable response to extremism (57%), there is widespread concern about its unintended consequences. The Christian faith has indeed been foundational to the historical development of the nation’s values, but this legacy is being eroded. 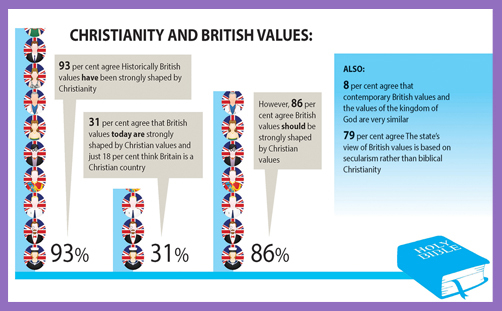 The survey showed that the vast majority of respondents (93%) agreed that Christianity had strongly shaped historic British values. Quite what the other 7% believe is something of a mystery. What history books are they reading? Indeed, do they read at all? Less than a third of respondents (31%) felt that Christianity still shapes those values today. Fewer than one in five (18%) agreed that Britain is a Christian country. It depends how one defines ‘Christian’, of course. • Half of Evangelicals think greed is the top ‘deadly sin’ among the British population, followed by 15% who chose lust. • Consumerism is the most commonly observed negative trait (picked by 65%), followed by obsession with celebrity (58%). • Charity is the top ‘heavenly virtue’ in the British population, chosen by 34%. Not a single person thought the virtue of chastity was most widespread among Britons. • Evangelicals are much more likely than the national population to believe “respecting Britain’s political institutions and laws” and sharing “Britain’s customs and traditions” were important aspects to being truly British. For the first measure, 96-85%, and on the second 84-50%. • Far fewer Evangelicals think an important characteristic of being British is being born in Britain (43% compared to 74% of the national population), having lived there most of one’s life (49% compared to 77%) and having British ancestry (35% compared to 51%). • 43% of Evangelicals think being a Christian is important to be truly British, compared to 24% of the British population. The questions relating to native ancestry aren’t insignificant in the fraught context of immigration and debates surrounding national identity. 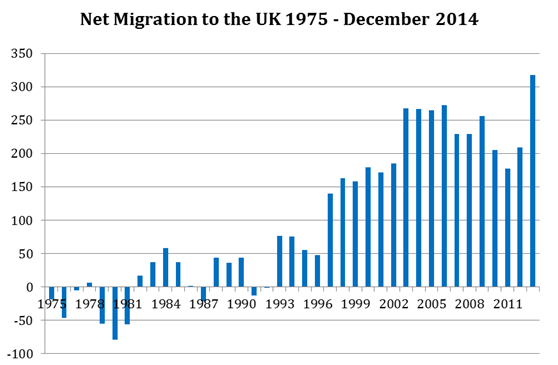 Here we are, under a Conservative government led by a Prime Minister who pledged to cap immigration at “tens of thousands“, and yet, at 318,000, net immigration is higher than it has ever been – even under any preceding Labour government. Last year, 323,000 native Britons emigrated and 641,000 foreign nationals immigrated, almost half of whom came from other EU countries, about which the Prime Minister can do absolutely nothing. Inconvenient truth or partisan cynicism? Stemming the flow proved impossible for the Coalition, not least because Britain’s EU membership is contingent upon the free movement of persons. If the overriding Conservative motives were, as Dr Landrum suggests, greed and consumerism – “suppresses wages and makes the rich richer” – the Thatcher years were a manifest failure. If the Evangelical Alliance really wants to restore fundamental Christian values to the heart of British society, they might begin by reappraising their own longstanding, fundamental and unquestioned support for Britain’s membership of the EU. Lower than ermine? Why is Ann Widdecombe not in the House of Lords?